School Bells Incorporated is back in Tennessee after another successful fifth year of servicing the rural areas of Belize. School Bells' mission is to provide medical services to rural Villages like Crooked Tree, Maskall and Burrell Boom. 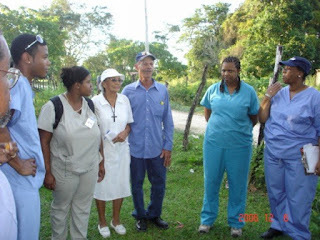 For over 5 days, the group of medical professionals-- which included Dentists, Pediatricians, General Practitioners, Pharmacists and Nurses-- traveled to Crooked Tree, Maskall and Burrell Boom Villages and provided much needed medical services. A total of one thousand patients, both adults and children, benefited from their services. "Most of the children in Crooked Tree suffered from skin and ear infections. The whole mission is to help Belizeans in the rural areas but we also helped school children in Belize City that we believed could use our support. The medical team travel with us back and forth every year. We also helped the children in the Toledo District schools in 2000 with our medical team. The schools and health centers send us the information of what is needed in the way of medical supplies and we provide the support". It is nice to see how people that have no connection to Belize is willing to help out in this disastor. Some of our own families over here should open their eyes so that they can see what strangers are doing and try to help without thinking that other people from Crooked Tree Village should bear this alone. We need to come together and give a helping hand to our Beloved Village. People are not begging or having fund raiser for themselves it is for the good of all the people in Crooked Tree.